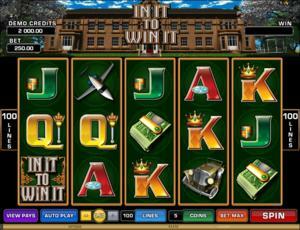 In It to Win It is an online video slot machine game released in July 2013. It is offered exclusively at online casinos powered by Microgaming. This video slot game has 5 reels and 100 pay lines. The theme of In It to Win It is largely about the spoils generated by big business deals of a successful tycoon. Do you have what it takes to be a rich and successful businessman? Then you have to be In It to Win It! When you play the slot game, you will definitely see that it has a luxurious yet old-fashioned feel to it. Watch out for the grinning businessman as he is the scatter symbol in this game that opens up to a Free Spin Bonus Feature game whenever you get 3 or more of his symbols. There is actually no wild symbol in the main game, but any 1 of the 4 regular symbols can become a wild symbol while you are playing out the Free Spin Bonus Feature game! Microgaming online slot games are available to players in 2 formats – download and no-download. Whether you like to download their software first or you prefer to play instantly without the need to download, then Microgaming surely has online slot machine games to accommodate your every slot gaming preference. Good thing that In It to Win It is available for instant play, so you do not have to download anything to find out if this game interests you in a way that you would like to spend some real money on it. In It to Win It is created for those who want to live a luxurious life from their successful businesses, and the desire to win some real money while enjoying a round of spins in this slot game. Most online slot players even refer to their game play as “risky as a big business deal” experience, especially when they took the chance at gambling their winnings. The In It to Win It online video slot game features scatter wins, a Free Spin Bonus Feature game with different wild symbols each time, a Gamble Feature game, a Skill Stop Feature that allows you to stop the reels from spinning even before they stop spinning on their own, a maximum coin jackpot of 50,000, and a maximum cash jackpot of $25,000! The quality of the graphics and sound that Microgaming provides is absolutely fantastic and top notch. They have an impeccable reputation of making the most stunning graphics and true-to-life sound effects that will truly transport you to “that specific theme” they used in any of their slot games. Most people love to play games incorporated with Microgaming software because they have smooth animation and engaging yet non-interfering sounds. In In It to Win It, players are taken to a vast estate of a flourishing businessman. The symbols perfectly complement the game’s rich theme – jets, vintage cars, and wads of cash. The symbols are created in 3D, and even if they are vibrantly colored, you will play here for a long time because it will not hurt or strain your eyes. Nice animated programming is used on the symbols when you successfully hit winning combinations. The overall graphic design of In It to Win It shows what looks like a huge mansion on top of the reels, complete with trees and even a gazebo on the side. The main colors used in this game are black, gold and green. There is no constant background music and sound effects you will hear while playing this game. When you spin the reels, a flickering sound will be heard. When you form winning combinations, simple arcade-type music and sound effects are programmed to celebrate your wins. Lively jazz music is played out when the Free Spin Bonus Feature game is in motion. The card deck symbols available in the In It to Win It online video slot game are J, Q, K, and Ace. The regular symbols that you will find in In It to Win It are: the Jet, Wad of Cash, Car, and the In It to Win It Logo. There is no Wild symbol in the main In It to Win It online slot game. However, during the Free Spin Bonus Feature game, the Jet, Wad of Cash, Car, or the In It to Win It Logo can become a wild symbol. The wild symbol can substitute for all other symbols (except for the Scatter symbol) to help you complete winning combinations. The Scatter Symbol is the Businessman. The scatter symbol is not required to appear in a line (on an enabled pay line) for you to win. The Businessman scatter symbol can be found scattered anywhere on the 5 reels, and you are able to form winning combinations as long as there are 2 or more Businessman scatter symbols that appear. Your winnings are calculated by multiplying the Businessman scatter symbol combination payout (refer to the Payout table) by the total number of coins you’ve bet. If you manage to get 3 or more Businessman scatter symbols, you will trigger the Free Spin Bonus Feature game. Please take note that if you get a scatter win and a regular win, then you are paid out for both of these wins, because the Businessman scatter symbol is not required to come out on an enabled pay line for you to win. Scatter awards are independent from pay line awards, and thus they are added to the pay line win. Please take note that if you get any winning combination, you can choose to gamble it in the Gamble Feature game (the Double Up button located on the middle of the lower reels), or you can just continue playing the regular In It to Win It online video slot machine game. If you click the Collect button to collect your winnings, the Gamble Feature game will end, and you will be returned back to the regular In It to Win It online video slot game. In It to Win It Free Spin Bonus Feature Game – If you manage to get 3 or more Businessman scatter symbols anywhere on the 5 reels, you will activate the Free Spin Bonus Feature game. You are presented with 4 briefcases that contains 10, 15, 20 or 25 Free Spins. Also, to sweeten up the deal, inside your chosen briefcase, one of the regular symbols (Wad of Cash, Car, Jet, or In It to Win It Logo) will become Wild during the Free Spins. The designated Wild symbol in the Free Spins will substitute for all other symbols, except for the Businessman scatter symbols. Please note that the Free Spins cannot be re-activated while playing the Free Spins Bonus Feature game. Once the Free Spin Bonus Feature game is over, you will be then taken back to the main In It to Win It online slot game, and your winnings from the Free Spin games will be included to your overall balance. In It to Win It has 5 reels where you may bet on 100 pay lines. The minimum bet is 0.01 and the maximum bet is 0.50 per pay line. You can wager 1 up to 5 coins per pay line bet. Therefore, the maximum bet amount is 250.00 per spin. Players who regularly play online casino games apparently like to stay much longer on online slot games that have an Autoplay function. It’s absolutely fantastic that In It to Win It comes with a helpful Autoplay function! You can have the game spin automatically for you with the Autoplay button (located on the left corner below the reels). Simply click on the Autoplay button and it will continue on spinning until: you have no more coins left to wager, or when you press on the Stop button. Give In It to Win It a spin and you will definitely enjoy playing this business-themed online video slot game!